During a recent trip to the junk yard, I happened upon a BMW e39 M5. A rare enough find on the road, finding one of these cars in a wrecking yard is almost impossible. Even better, it was largely intact. It was trashed, as most junked cars are, but it had a few valuable pieces left over. 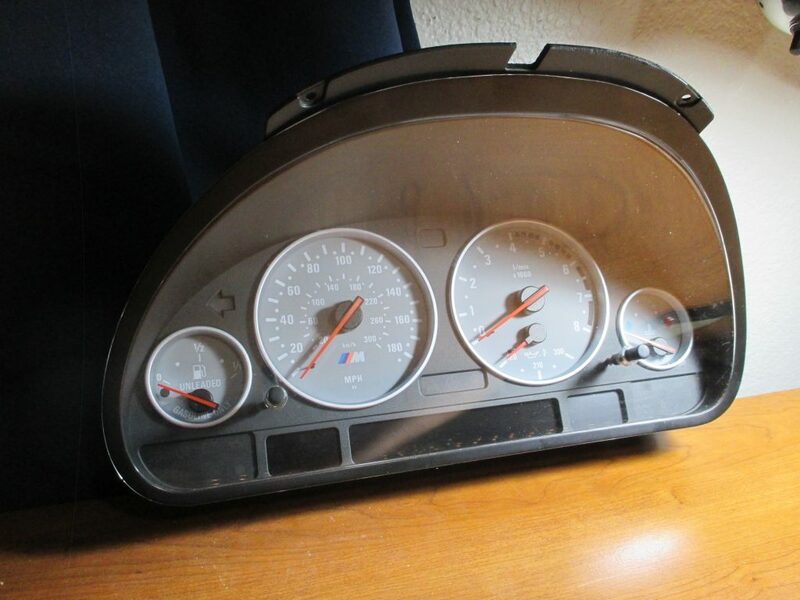 One of these pieces is the gauge cluster. This particular one was in almost perfect condition, and a quick check on eBay shows that they can sell for upwards of $500. However, I wouldn’t feel comfortable selling a part like this for so much money without being 100% sure it was fully functional. 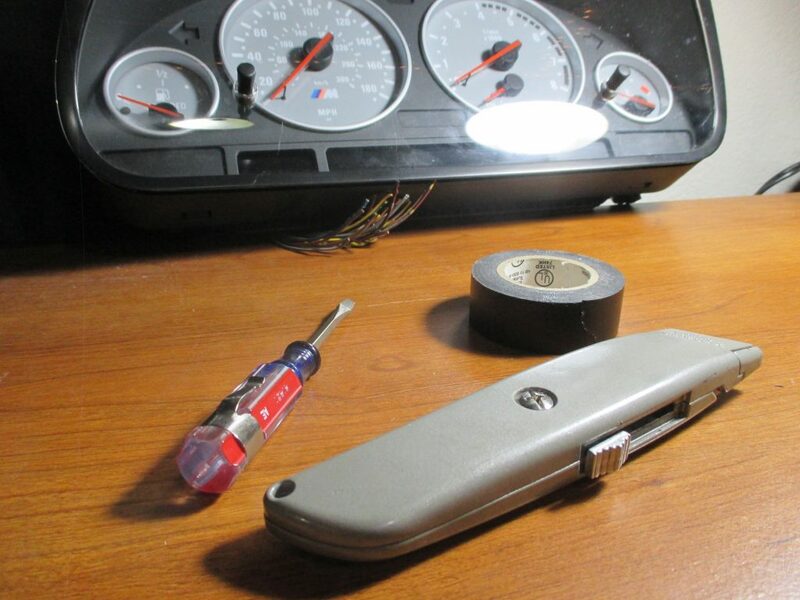 However, without a spare e39 laying around to plug the cluster into, testing the piece posed an issue. On the back of the cluster, there are three plugs: a white one, a black one, and a blue one. The diagram is referring to these white and black connectors, and the blue one can be ignored as it is not needed for this test. The only tools I needed were a small flat tip screwdriver and a razor blade. 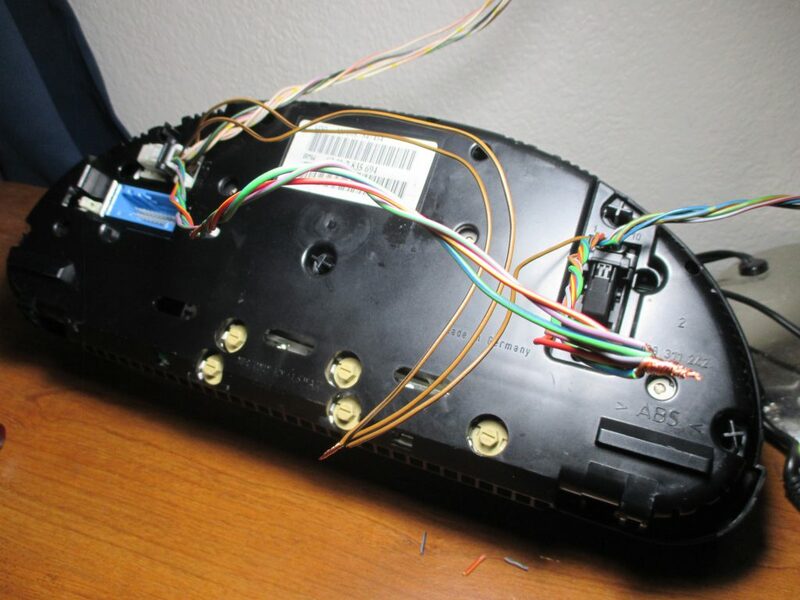 Start by removing the white and black plugs from their spot on the cluster, and use the screwdriver to get the housing off of the part holding the electrical pins. Be sure to remember which one is which! From here, trace out which wire leads to each pin shown on the diagram. Once you have them separated out, begin stripping the ends so we can connect to them later. I use a utility knife for this, but a purpose-built wire stripper is probably easier and safer. 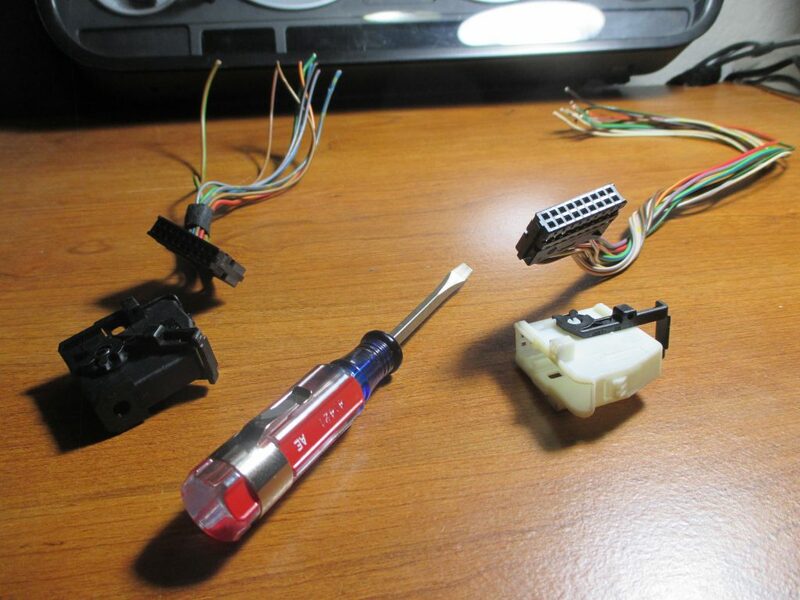 Once all the necessary wires are stripped, insert the pin portion of the connector back into the white and black housings, and plug them back into the cluster. 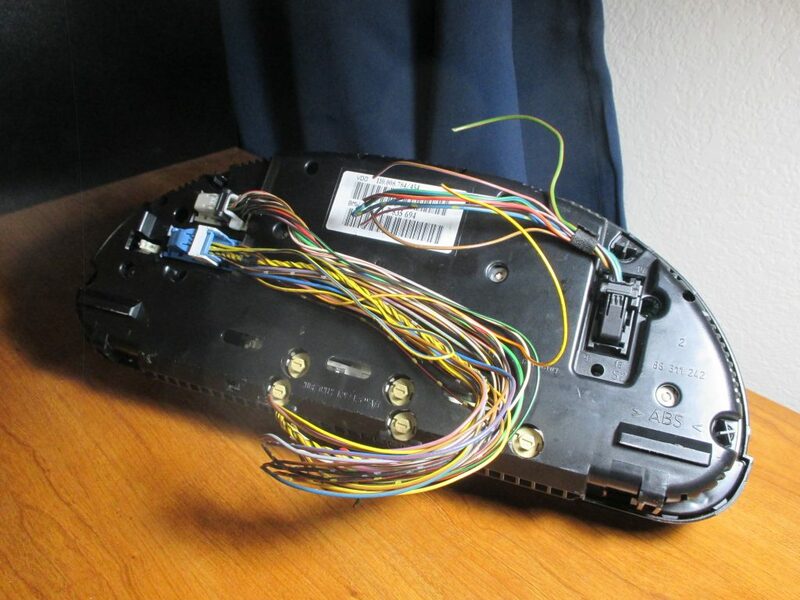 Take all of the stripped ground wires and twist them into a bundle, and do the same with all of the +12V wires. In this picture the ground wires are the brown bundle on the left, and the +12V are the larger, more colorful bundle on the right. Everything else can be pushed out of the way. Now, we need a 12V source. A car battery can be used for this, and is probably the best way to do it, but my car is way out in the cold garage and I’m working at my desk. 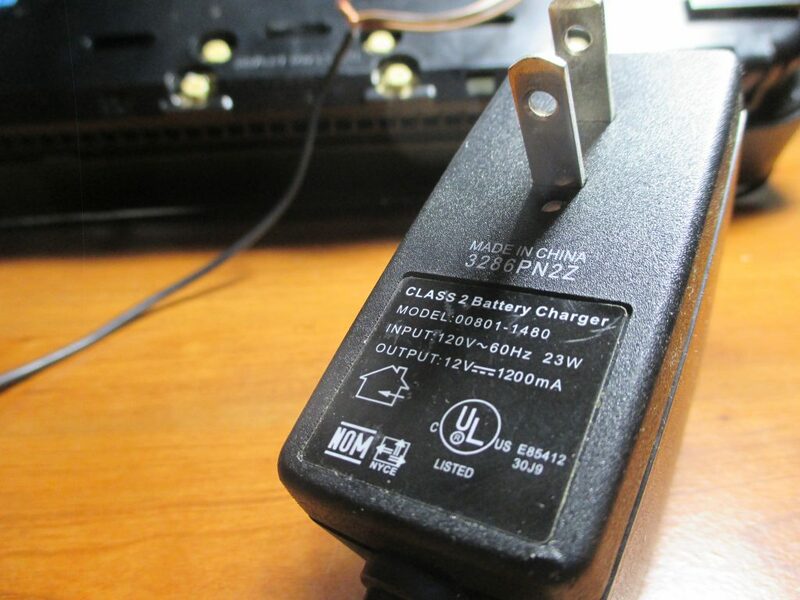 I chose to use an old wall charger for one of those plastic ride-along cars that we all wanted as children. I never had the car, but I had the charger laying around with the wires stripped from a previous project. It outputs 12V, and is perfect for this. I used a Harbor Freight multimeter to determine which wire was positive and which one was ground, and hooked up the wires from the charger to the correct bundles at the cluster: positive to positive and ground to ground. Moment of truth… Plug ‘er in and watch for smoke. We have life! At this point I was practically jumping around in my room, both because this sketchy looking setup actually lit up all the lights I wanted it to, and because I didn’t fry the cluster in the process. 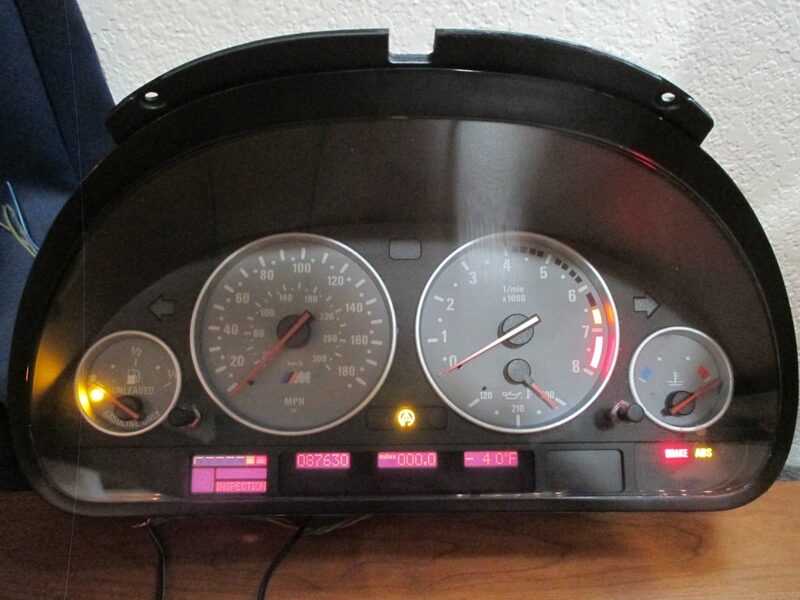 All the pixels still work on this unit, which can be a common problem for cars this old. It looks like the donor car only had 88,000 miles too, which makes it even more of a shame that it was in the condition I found it in. No matter though, this part is still in great shape and I’ll definitely be able to turn a profit on it. Look for it on eBay soon if you need it! Most women consider pregnancy to be a magical phase in their lives and even though we are prepared for what’s coming no one is usually fully prepared for the changes. As your body changes to accommodate the precious life you are carrying so will your routine and lifestyle.